The Jewish presence in Greece goes back at least to the times of Alexander the Great king of Macedonia . As a result of the Alexander's conquests and subsequent Greek rule in Palestine, the Hebrew term "Javan" as it appears in the Bible was generally translated by the rabbis "Macedonia" (cf. Targum Pseudo-Jonathan to Gen. 10:2; Yoma 10a). Although the origins of a Jewish community in Greece are unknown, Strabo mentions in approximately 85 B.C.E. that Jews could be found in all the cities of the eastern Mediterranean (VII 7 4). There may well have been Jews, if not Jewish communities, living in Greek cities as far back as the Babylonian Exile (586-530 B.C.E.). After the wars of the Maccabees, between 170 and 161 B.C.E., many Hellenized Jews left Judaea and settled in the new commercial centers, such as Alexandria and Antioch, of the Hellenistic world. From these communities smaller groups moved to some of the coastal Aegean cities such as Ephesus, Smyrna, Thessaloniki, and Chalkis. According to Jesephus , Kassandros who built Thessaloniki, asked King Ptolemei of Egypt to send him Jewish artisans marking the beginning of Thessaloniki's Jewish community. It is certain that such communities existed toward the end of the Second Temple period . Philo, in the list of Jewish communities quoted from the correspondence of Agrippa I to Caligula, refers also to the Jews of Macedonia (The Embassy to Gaius, 281). In any case, by the time of the Apostle Paul there were flourishing Jewish communities in most of the major Greek cities. The fact that Paul and his followers made a number of journeys to Greece, and that their doctrines were readily accepted there, tends to substantiate the existence of a Jewish colony (cf. Acts 16:9; 18:5; 20:1; I Cor. 16:5; II Cor. 1:16; 2:13; 7:5). The famous 12th century record of the Jews of Greece compiled by Benjamin of Tudela during his travels through Greece indicates a uniform dispersion of Jewish communities. The Jewish community of Thebes was so closely identified with the silk industry that Roger II of Sicily (1095-1154) forcibly moved almost the entire community to Sicily to introduce the silk industry in his Norman kingdom. The Jews of Greece during this period ( Byzantine) can be described as “Romaniot” Jews, i.e. , Jews of the empire of the “second Rome”. A second wave of Jewish immigration took place in 1492 when Ferdinand and Isabella proclaimed the Edict of Expulsion for the Jews of Spain. By the third quarter of the 15th century Greece as the rest of the Byzantine provinces were under Ottoman rule. Ottoman policy toward minorities was based on Islamic law, which recognized both Jews and Christians as a separate millet (nation) with religious and - to an extraordinary extent - legal autonomy within their own communities. Over 20,000 Sephardim or Iberian Jews arrived in Thessaloniki the same year. Soon afterwards 36,000 Jews left Sicily, many of them to settle in the Balkans. Finally the last Jewish immigration to Greece came from the north .After the Greek Independence war the Bavarian King Otto I of Greece settled in Athens in 1834, With him came a man named Max Rothschild, perhaps the first Jew to arrive in the new capital. He was soon followed by a number of other Jews, most of them Bavarian and therefore Ashkenazi in background. Within a short period of time Jews from Turkey, many of them from Smyrna began to settle mainly the city of Athens. 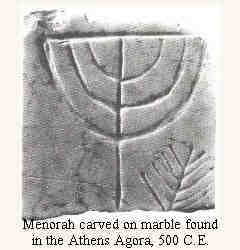 By the middle of the 19th century a small Jewish community had been well established in Athens. Each new Jewish group brought along its own traditions and attained different levels of assimilation. Jews built international trade and maintained close commercial ties with the families they had left other parts of Europe and North Africa. Thessaloniki at this period was, according to the poet Samuek Ushkue, the "Metropolis" of Israel, city of Justice mother of Israel, like "Jerusalem".